Was it ever hot!! Heritage Days was a success even though the temp was in the 90's and the heat index said it felt like 100 degrees. 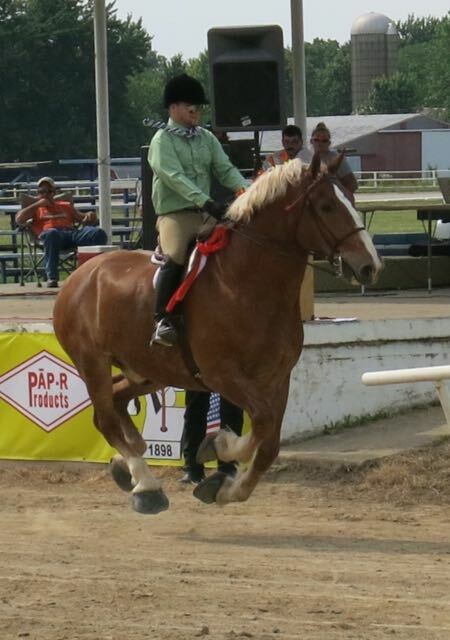 The Horse Show was a success! John Hobbs preached 2 excellent sermons yesterday with two local church worship teams leading us in worship. There were many artist vendors selling handmade creations. We had lots of good music provided by Central & Southern Illinois bands. There were 10 teams of 2 each in our first ever Corn Hole tournament. 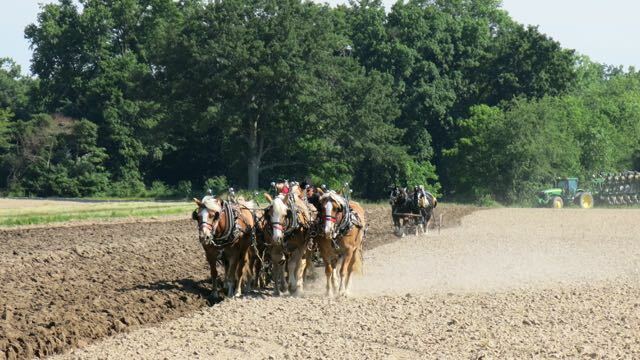 The horse farming demonstration was very interesting with several horse & mule teams participating. Everyone who attended seemed to be having a wonderful time. The only disappointing part was that the attendance was down because of the heat but there's nothing we can do about the weather. 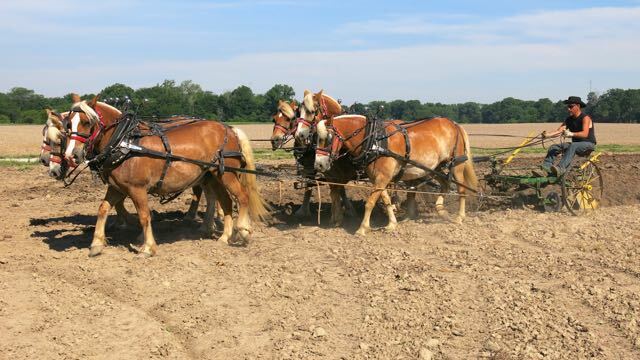 I had never seen six horses hitched in two rows of 3. 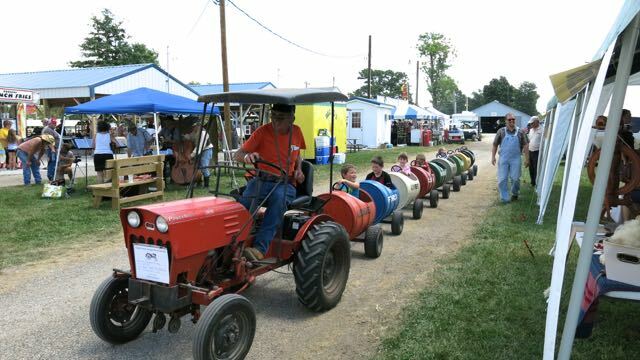 As always, the barrel train ride was very popular with the kids. I saw one little girl, in particular, who didn't want to get off--even after several trips! There were horses of all sizes represented. These little guys displayed the flag for the national anthem and brought in the Horse Show judge. 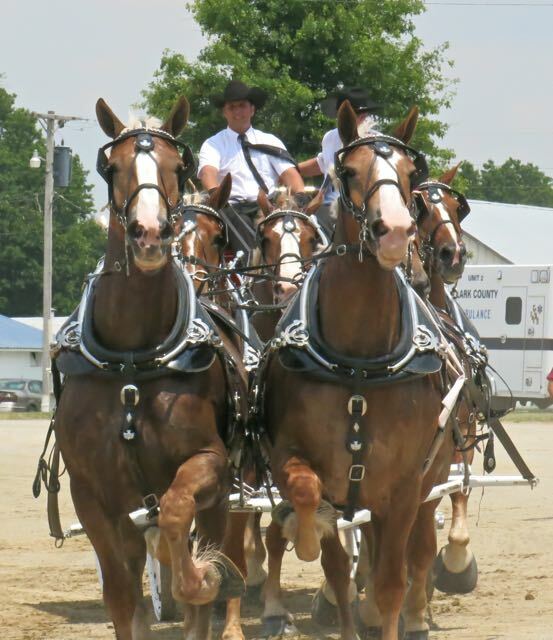 Six Horse Hitches are so impressive! This is a well-matched team of Haflingers. Very intimidating when they are coming right at you! 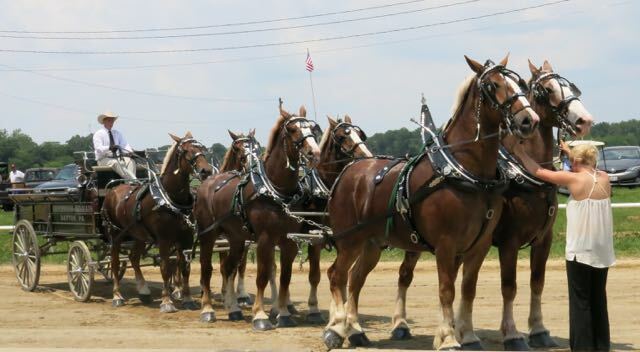 This was my favorite draft horse team. 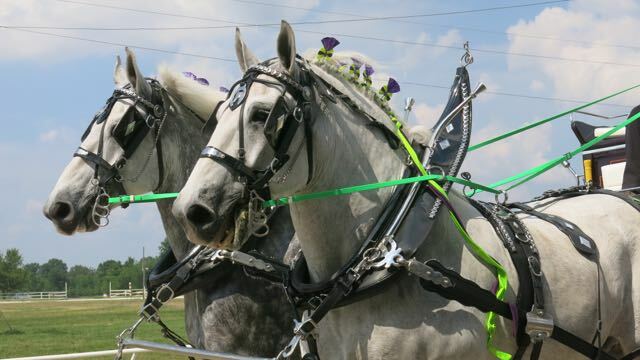 They won the National Classic 6 Hitch class. 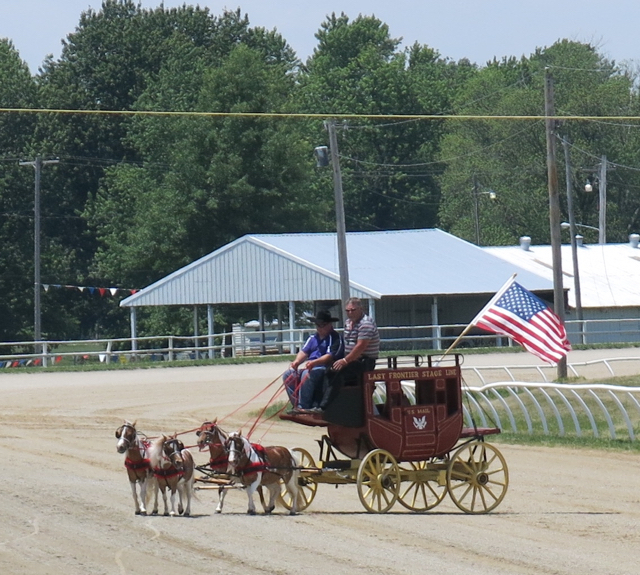 We were very impressed with the agility and maneuverability of the mules! Our friend, John Hobbs, who was the speaker for the Community Church Service is from Wilmington, NC. 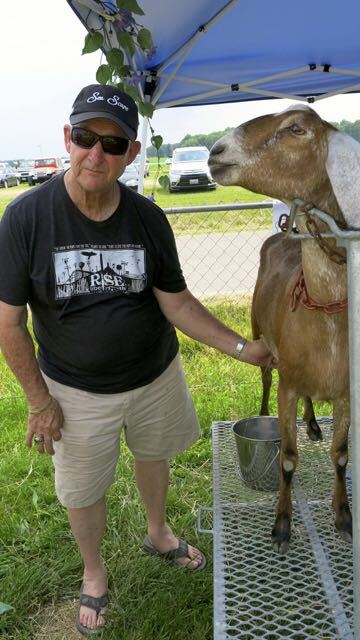 He had never seen a goat milked so he decided to try his hand at it. We could think of several hilarious captions for this photo! Notice that 3 feet are not touching the ground. Amazing, isn't it? 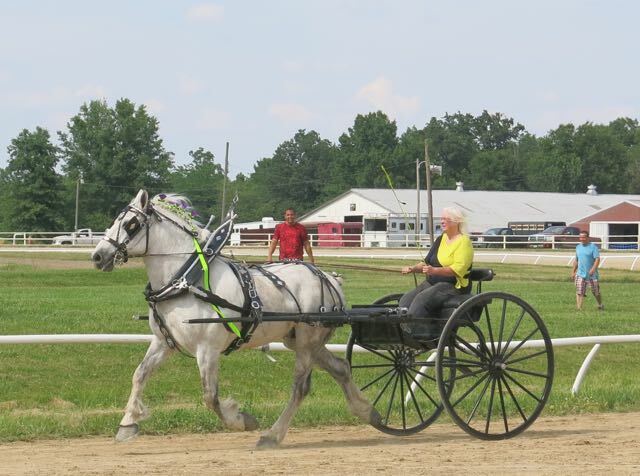 The Draft Classic Cart Class is a new class this year. There were 9 entrants. 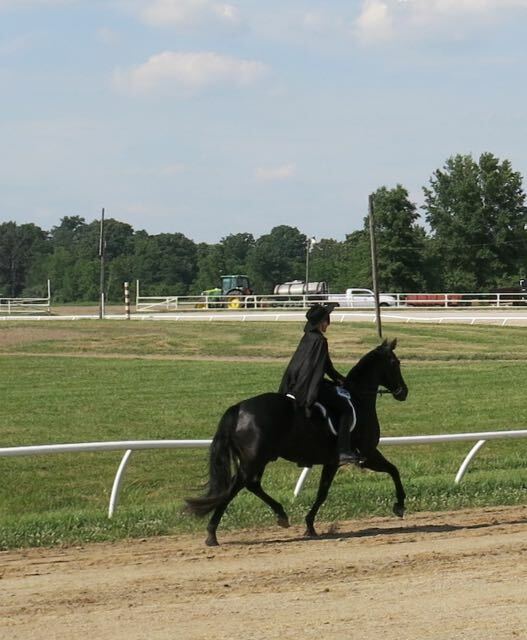 I took this photo of one of the contestants in the Horse Under Saddle Class. I couldn't believe it when I saw all four feet were off the ground!